I had this GHOST shape idea in my head. It turned out so Fancy" with all the bling, glitter, silver cording and Sue Wilson's Border Dies that kick it up a notch! hah! Stamps: STAMPABILITIES, House-Mouse Designs, Cling Stamp called "Interview with a Vampire", HMJR1097, featuring Monica and Muzzy. 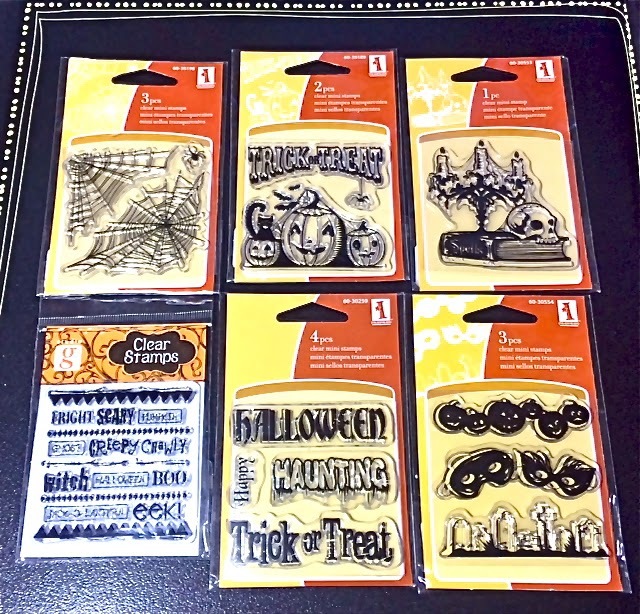 I also have the following mini sets of Halloween clear stamps as Blog Candy for one Lucky Follower. Will it be you? All you have to do is post a picture of this Halloween candy to your Blogs with a link back here. Then become a follower of my blog. Dont forget to also leave a comment. That's it! :) Winner will be chosen on Halloween Night, (October 31st), and announced here on the following Morning. So be sure to follow all the rules to enter. Good Luck to you! And what great and fabulous stamps your so kind. Beautiful white creation, love the image and border! Love those Halloween stamps, can really help me to make Halloween creation:) Thanks for the chance to win! Posted the pic in my sidebar. Lovely card!!! And thanks for the chance to win those fun halloween stamps!! 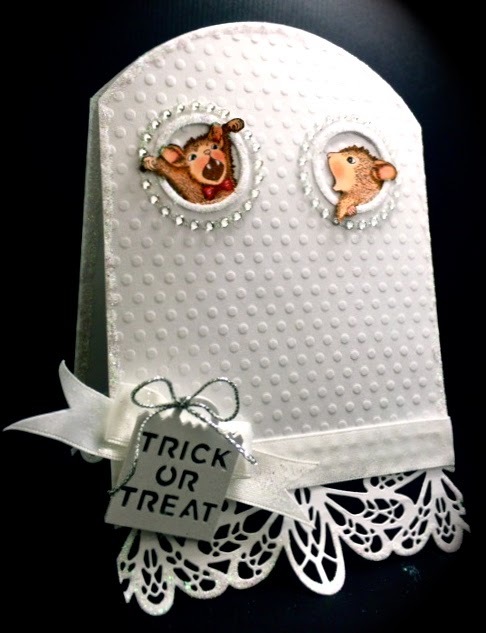 very nice Halloween card - and the white colour is so unusual for this theme, but it looks great!! I love this card America! It is fabulously adorable. Thanks for a chance at some Yummy Good For Me Candy! I do follow and I've put this on my blog too! what a beautiful ghostly card! I love your white-on-white card! The die-cut trim is gorgeous! I made a card for the challenge too! Thank you for the chance to win your Halloween candy - I've been following you for a long time and I just added your badge to my sidebar. Happy Halloween to you and your family! heehee i definitely love the way you use your mice images! thanks for sharing at love to scrap! Thank you for joining this week at Not Just Cards Challenges Good luck and We hope you'll join us again soon. This is adorable! Love the portholes and mice! Thanks for joining the Craft-Dee BowZ October Challenge. Gorgeous, elegant, and oh such fun!! Super Halloween card, lucky recipient! Oh wow what a fabulous design, just love the sweet images, lovely shaped card too. Thank you for sharing at CCM. Thank you for joining us over at Not Just Cards Challenge Blog. What a cute card!! Very ghostly!! The little mice are so cute!! Thanks for joining us at Through the Purple Haze Challenges! Awww this is so sweet! 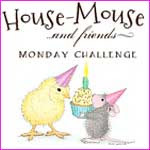 I love that fabulous design and the cute little mice! Thanks so much for joining us at HOC this month! This is funny! But it's also so elegant! Thanks for joining us at Not Just Card! Such a fun and clever ghost! Love the mice. 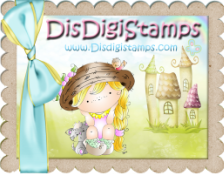 Thank you so much for sharing with us at Simon Says Stamp Monday Challenge Blog!! For something for Halloween this is fun and beautiful. I see this could be used any time of year. I would love to case your idea. The die border is gorgeous and I must go find it. Thank you for the inspiration.